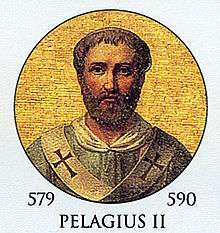 Pope Pelagius II (520 – 7 February 590) was Pope from 26 November 579 to his death in 590. Born in 520, Pelagius was a native of Rome, but probably of Ostrogothic descent, as his father's name was Winigild. Pelagius appealed for help from Emperor Maurice against the Lombards, but the Byzantines were of little help, forcing Pelagius to "buy" a truce and turn to the Franks, who invaded Italy, but left after being bribed by the Lombards. Pelagius labored to promote the celibacy of the clergy, and he issued such stringent regulations on this matter that his successor Pope Gregory I thought them too strict, and modified them to some extent. During his pontificate, the bishop of Milan, who had broken communion with Rome in the Schism of the Three Chapters, returned to full communion around 581, while other bishops in Northern Italy remained in schism. Pelagius ordered the construction of the Basilica di San Lorenzo fuori le Mura, a church shrine over the place where Saint Lawrence was martyred. During his reign, the Visigoths of Spain converted, but he also faced conflict with the See of Constantinople over the adoption of the title of "Ecumenical Patriarch," which Pelagius believed to undermine the authority of the papacy. Pelagius fell victim to the plague that devastated Rome at the end of 590. 1 2 3 4 5 6 Mann, Horace K. (1911). "Pope Pelagius II". In Herbermann, Charles. Catholic Encyclopedia. 11. New York: Robert Appleton Company.